A small early Tarsiiforme specimen, named Archicebus achilles, lived some 55 million years ago in what is now Central China, it has been known from a recently discovered fossil (right). This primate was already an ancestor of modern tarsiers, then just diverged from the line leading to us Anthropoidea, what comes to support the theories that suggest an old origin of the primate lineage, possibly c. 85 Ma ago, still in the Cretaceous era, when T. rex and all the famous Hollywood dinosaurs still roamed the Earth. And this has of course implications as well for the origin of mammals, popularly believed to be in a very early stage of their evolution in that period… but maybe much more diversified than some pop documentaries want us believe. Until now the oldest known primate was Plesiadapsis, a proto-lemur that may look maybe more like a squirrel than a primate (at least to my eyes). Plesiadapsis is from the same time as Achicebus, c. 55-58 Ma ago. evolution. Nature. Vol. 498, June 6, 2013, p. 60. A new study has found that blood group A and B alleles have been stable (albeit in likely dynamic equilibrium) in the primate family since… always. The ABO histo-blood group, the critical determinant of transfusion incompatibility, was the first genetic polymorphism discovered in humans. Remarkably, ABO antigens are also polymorphic in many other primates, with the same two amino acid changes responsible for A and B specificity in all species sequenced to date. Whether this recurrence of A and B antigens is the result of an ancient polymorphism maintained across species or due to numerous, more recent instances of convergent evolution has been debated for decades, with a current consensus in support of convergent evolution. We show instead that genetic variation data in humans and gibbons as well as in Old World monkeys are inconsistent with a model of convergent evolution and support the hypothesis of an ancient, multiallelic polymorphism of which some alleles are shared by descent among species. These results demonstrate that the A and B blood groups result from a trans-species polymorphism among distantly related species and has remained under balancing selection for tens of millions of years—to date, the only such example in hominoids and Old World monkeys outside of the major histocompatibility complex. Razib has some more details on the matter (being PPV, I haven’t read it). Still he wonders what kind of disease or otherwise evolutionary pressure may have been so virulent as to keep the whole order of primates (or at the very least all simians) on our toes all these millions of years. The answer may well be known already: it seems that type A blood protects against the plague, while type B protects against smallpox, both great historical killers of those without enough defenses. However they may favor other less important health problems like blood clots or cancer, enough to exert a mild pressure in favor of a return to the basic type zero (“O”), which would have evolved by loss of function once and again. Whatever the case I find fascinating that these immune mechanisms may be so extremely persistent and I wonder if the bacterian mechanisms they confront may be more generic than just an specific disease. See also: maps of distribution of major blood types. Update: a pre-print copy of the paper is available at arXiv. I have said that several times. So I’m not going to miss the opportunity of saying it once more: the 5 million year figure for the Pan-Homo divergence is a total nonsense: it’s more like 8-10 million years. Even the less exaggerated hunch (not sure on what is based) of 7 million years is too short. New research, using mathematical-statistic analysis with not one but several cross-references, produces an older figure: some 8 million years. Richard D. Wilkinson et al., Dating Primate Divergences through an Integrated Analysis of Palaeontological and Molecular Data. Systematic Biology, 2010. Pay per view. Estimation of divergence times is usually done using either the fossil record or sequence data from modern species. We provide an integrated analysis of palaeontological and molecular data to give estimates of primate divergence times that utilize both sources of information. The number of preserved primate species discovered in the fossil record, along with their geological age distribution, is combined with the number of extant primate species to provide initial estimates of the primate and anthropoid divergence times. This is done by using a stochastic forwards-modeling approach where speciation and fossil preservation and discovery are simulated forward in time. We use the posterior distribution from the fossil analysis as a prior distribution on node ages in a molecular analysis. Sequence data from two genomic regions (CFTR on human chromosome 7 and the CYP7A1 region on chromosome 8) from 15 primate species are used with the birth–death model implemented in mcmctree in PAML to infer the posterior distribution of the ages of 14 nodes in the primate tree. We find that these age estimates are older than previously reported dates for all but one of these nodes. To perform the inference, a new approximate Bayesian computation (ABC) algorithm is introduced, where the structure of the model can be exploited in an ABC-within-Gibbs algorithm to provide a more efficient analysis. Press article at Science Daily. A central issue is that fossils are seldom preserved and discovered, so fossil evidence can well be five or 5.5 million years old and the divergence be in fact older. But combining fossil and genetic data it is possible to refine the equation and get to much more accurate estimates. That’s what the authors have done in what should be celebrated as a the convergence of genetics and archaeology (paleontology in this particular case), a convergence much needed indeed. 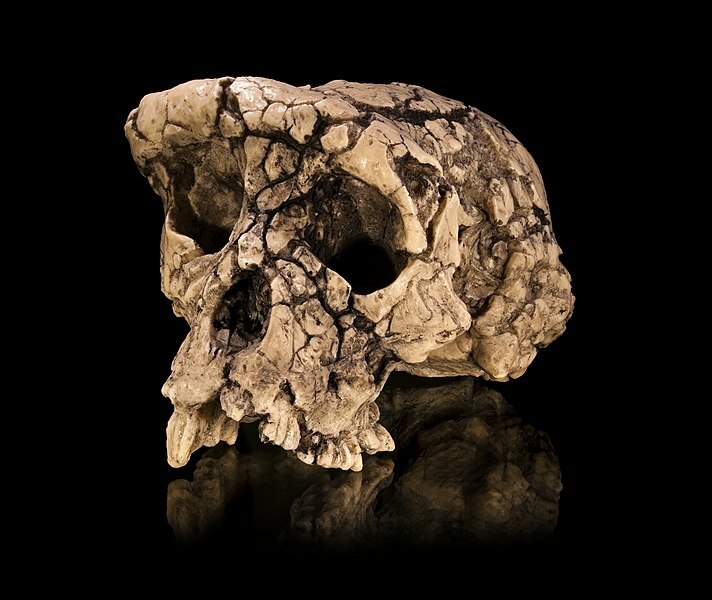 One of the particular fossils which find new room into the potential Human ancestry is Sahelanthropus tchadensis, Toumaï, which fits well in the evolutionary line of Homo sp. but was earlier thought by many as too old for that. Another aspect vindicated by this study is that primates lived in the late era of the dinosaurs, what really allows them to have reached South America without need of swimming across an ocean which did not actually exist yet. This was actually addressed by the same team in 2002 but its obvious implications in human evolution were ignored. So they have now decided to address the matter themselves, what is very much appreciated, because they must be damn right. New paper on Chimpanzee and Bonobo genetics (it deals with research on the Pan genus that must push the Homo-Pan divergence to at least 8 million years ago, on hindsight a more important post than the title suggests).